Studying to be a teacher? Share your views via Tomorrow’s Teachers Speak Up! Compared to their more experienced peers, first year teachers reported less technology use for professional tasks. When asked how often they assign homework or projects that require students to access the Internet outside of school or class time, 54% of first-year teachers said rarely or never compared to 47% of those with more than 11 years experience. Teachers in both groups shared similar interests in their top choices for professional development topics. 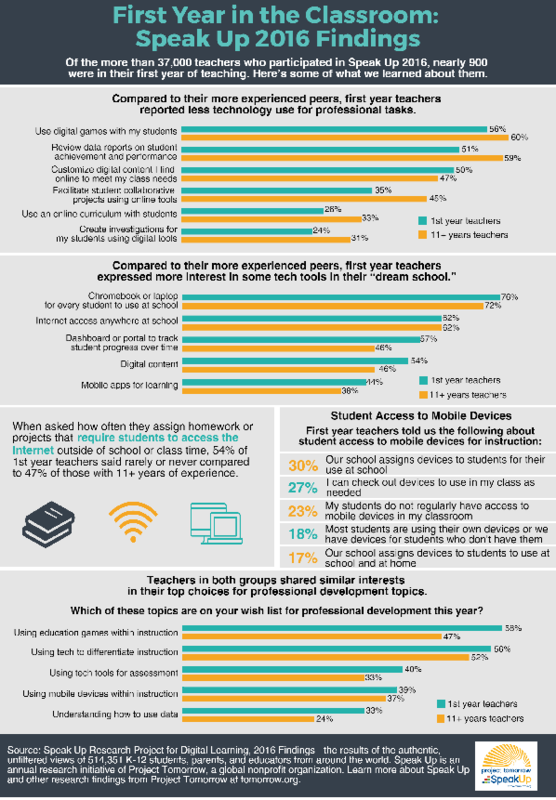 For the more experienced teachers, using technology tools for formative assessment and identifying mobile apps to use in class were among their top five. Compared to their more experienced peers, first year teachers reported greater confidence in their own technology skills. Source: Speak Up Research Project for Digital Learning, 2016 Findings - the results of the authentic, unfiltered views of 514,351 K-12 students, parents, and educators from around the world. Speak Up is an annual research initiative of Project Tomorrow, a global nonprofit organization. Learn more about Speak Up and other research findings from Project Tomorrow at tomorrow.org.